Six months ago a wealthy businessman approached me at the Americano and wanted to take me to dinner. Two months prior to that two wealthy businessmen approached me and a girlfriend, again at the Americano, and did take us to dinner at Boulevard. They ordered fancy French and California wine, that predated my birthdate, and Foie gras. Anyhow, the most recent gentleman in question had a dual purpose, fancy dinner and wine and a get rich scheme that involved blogging and syndicated content. At one business meeting (that he showed up to with chocolates in hand) he asked me and another colleague what our short term and long term career goals were. At the time I answered something to the effect of making a salary that could continue to support my affinity for traveling and expensive luxury sports like skiing. She answered, “I just want to be able to work from anywhere.” Damn, that was a good answer. I’ve got all three in New Zealand. The beaches, Lake Ferry, Castle Point, Hawkes Bay, Marlborough sounds have all been lovely. My Blackberry isn’t a world phone, but I’ve got access to the Thomson Vineyards database, electronic contracts, the 2009 Preliminary Grape Crush Report, gmail (the essentials); and plenty of wine. Side note: I’ve been posting the “New Zealand Wine of the Day” on Twitter @ThomsonVnyrds. When the day calls for a cocktail on the deck rather than wine, I’ve been posting that too! 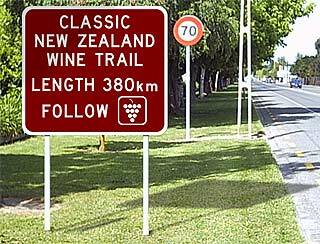 Some notable experiences have been Ata Rangi in Martinborough and TeAwa in the Gimblett Gravels Grape Growing District out of Hawkes bay. We’re headed to Marlborough February 22-24 just before we get back to the USA on February 26; where I will indeed have a beach 20 blocks from my flat in San Francisco, my Blackberry will be fully charged up, and I’ll have added quite a few Kiwi bottles to my basement collection. But that leaves me with one essential component lacking: work.